Talk of Russia opening its ‘eastern gate’ has been heard for a long time, but no breakthroughs in this direction were observed until recently. The project of a ‘free port’ can be viable only if it is focused on the needs of the regional economy. In the early 20th century, Vladivostok was the largest port in the region, but now its significance is minimal. 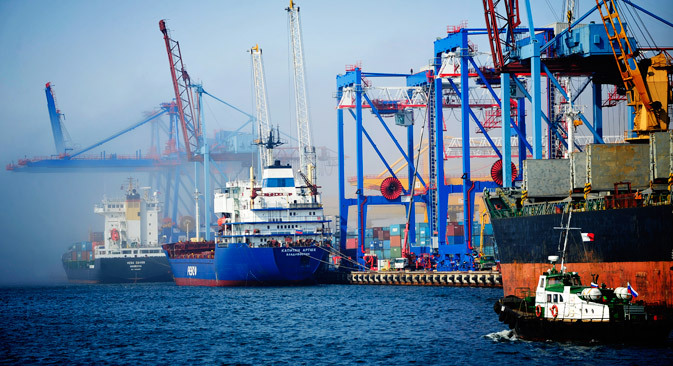 In 2014, Vladivostok processed only 15.3 million tons of cargo, compared to 390 million tons in the Chinese port of Dalian, 330 million tons in Busan, Korea and almost 230 million tons in Nagoya, Japan. Due to a sharp decline in Russia’s foreign trade, the gap will be even greater in 2015. In the ocean economy era, when the share of the maritime transportation in international trade turnover amounts to 67-68 percent, and more than 60 percent of the global gross domestic product is produced in the territories, separated from the sea by less than 100 miles, this gap requires decisive corrective measures. However, two factors prevent the situation in the Russian Far East from improving. On one hand, Russia had and still has an extremely slow bureaucracy, suspicious of business. Customs, regulatory and permitting authorities, law enforcement agencies and the tax office – they all create by their activities a much worse institutional environment than the one that attracts investors in the Republic of Korea, China and other Southeast Asian countries. This is why the experience of free economic zones, which became the main driver of China's economic growth, has not caught on in Russia. In addition, the total GDP of all subjects of the Russian Far East and Siberia is $265-280 billion. This is less than the GDP of any country in Southeast Asia, with the exception of Laos, Cambodia and Brunei. If the economy of eastern Russia is weak, what can an entry point offer? Little, hence the current status of the Primorye Territory, of which Vladivostok is the administrative center. Everything seems to indicate that the Russian leadership is aware of the problem, since President Vladimir Putin instructed the Federal Assembly in December 2014 that free port status, which Vladivostok had in 1862-1900 and 1904-1909, be returned to the city. Following this, the government filed the bill “On the Free Port of Vladivostok” with the parliament. But will these efforts bring the results that Moscow counts on? I would say that they could, if both the bill in itself and the overall development strategy of the port are substantially improved. When the first page of the bill describes the possibility of early “disestablishment” of the free port in case of the necessity “to protect the life or health of citizens, cultural heritage, environmental protection, to ensure national defense and state security,” it becomes clear that the status of the territory can be reviewed at any moment. When it turns out that the free port is controlled by a supervisory board, headed by one of the deputy prime ministers, any doubts on whether all decisions would go through Moscow and take months disappear. Finally, it turns out that the free customs zone regime, which constitutes the essence of a free port in the rest of the world, applies only to “part of the territory of the free port of Vladivostok, where seaports, part of the airport are located, as well as parts of the territory adjacent to the Russian Federation state border crossing point.” The rest of the area comes under the laws on special economic zones and territories of priority development. Also, one needs to be aware that Vladivostok is not the best place to build a free port in the Russian Far East today, since there is a naval base. The military, whose interests cannot help but be taken into account, uses many harbors. In addition, there are few large stretches of free space in Vladivostok for the creation of industrial parks. The city is located more than 100 km away from the China border. All of this means that Russian officials proceed from the fact that to be attractive, a ‘free port’ should be ‘freer’ than the rest of Russia, forgetting that they should compete not with other Russian territories, but with free zones in neighboring Asian countries. In my view, the project of a ‘free port’ can be viable only if it is focused on the needs of the regional economy. If you look at a map, it is easy to note that the strategic importance of the Primorye Territory is also in the fact that it cuts off a huge area of northern China from the sea. This includes three provinces (Heilongjiang, Jilin and Inner Mongolia) with a population of 90 million people and a GDP of $750 billion. Goods produced here should be delivered to the ports of Dalian and Yingkou to be loaded on ships at 1,100-2,300 km away from the places where they were produced, to be sent both abroad and to the ports of southern China. Therefore, the port should be established at a minimum distance (20-25 km) from the Chinese border (for instance, on the basis of the small port of Zarubino in Trinity Bay [42° 38' N and 131° 06' E]) and connect with the territory of modern China by a highway and a railway, which would also have extraterritorial status. An area of about 200-250 sq. km could be set aside around the port, surrounded with a wall, and with the customs and border check points set up, as it is done, for example, in the Chinese Shenzhen. Then Chinese goods would go through the port to Japan, the United States, the Philippines, and to China itself – just as goods from these countries destined for the northern Chinese provinces. Given the scale of the economy of northern China, a new port could easily start transshipping 80-100 million tons per year as early as in five or six years. According to experts of the Far Eastern Federal University, the object of this scale would increase Primorye's GDP by 30-35 percent compared to current levels. How this policy leads to local economic breakthroughs can be seen in an example of an industrial complex at the port of Jebel Ali in Dubai. The experience of rapid industrial development in China shows that the so-called greenfield projects – not developed in the course of “modernization” of long-obsolete facilities, but set up “from scratch” – proved and continue to prove to be most successful. The most recent example is the development of the project of “informational metropolis” in Qianhai near Shenzhen. Russia has long dreamt of becoming a transit country, serving cargo flows between Asia and Europe. But as long as there is the Suez and as long as businessmen care about price and quality of transportation on Russian railways, why does Russia not try to cash in on the far shorter and more lucrative transshipment routes?